filming near your hometown need you! Thousands of scripts are being filmed every day on locations across the country. Yes! even in your area casting directors need local talent of every variety! Now all barriers are broken down with this step-by-step, easy-to-understand guide to getting those acting jobs you want- Become an actor without leaving home! Land Acting/Modeling jobs in your local newspaper. How to Get Your Child into Acting Business. How to Become an Actor and Get a Part in a Movie. Get the right picture and resume for actors. Find a Talent Agent in Your Area. What casting directors are looking for in actors. Along with each state's recent credits. What you NEED to KNOW about getting into the business. 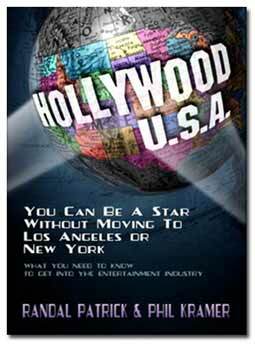 HOLLYWOOD USA Copyright c 1995 by Randal Patrick And Phil Kramer. Contents may not be reproduced in any form, either in part or whole, without the authors’ expressed written consent; except by reviewers, who may quote brief passages in a review. All rights reserved.